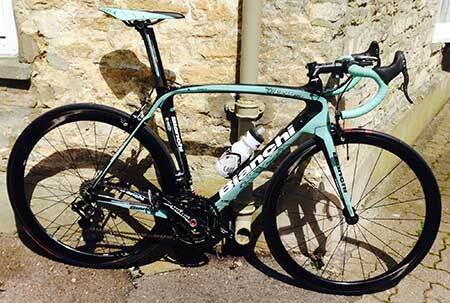 Bianchi Oltre XR.2 – £15,000 dream bike? I’ve been working through some options with Veloton in Tetbury for my new bike, but having failed to fall in love with a Bianchi Intenso in the classic ‘Bianchi’ blue-green colour scheme, they pointed me at a Bianchi Sempre. Although the Intenso and Sempre are fairly close in their geometries, I was keen to try a Sempre, as the lower headtube suggested going for a larger frame size. 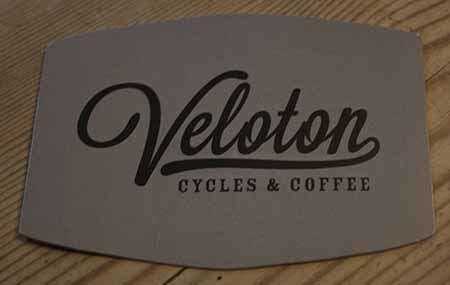 Fortuitously Veloton had a bike available for a quick demonstration that was the same size and geometry as the 57cm Sempre that I was heading towards. However, this wasn’t a Sempre, it was a Bianchi Oltre XR.2 with a few trick upgrades – total cost just shy of £15,000. Fair play to Martin and Pete at Veloton for taking their pride and joy for a two mile spin out to Long Newton and back, but you could sense them wince slightly as the bike was wheeled out of the shop. It’s worth noting that I didn’t realise the true cost of the bike until I got back to the shop after the ride – I was thinking, it’s a nice Oltre, it’s probably about £6000, but hadn’t realised the cost of the additional bling bits. A ‘base’ Bianchi Oltre XR.2 is £9,500, Rotor power cranks are £1450 and would need a suitable Garmin computer, plus the wheels (which I think were Zipps) were about £2500. Just from the ‘pick-it-up-in-the-shop-thing’ it was clear that this was a very light bike, but it was the overabundance of carbon that made the total thing ‘ping’ that was the most striking factor in the set-up – carbon generally isn’t very forgiving, and because it’s so stiff you tend to find components, like wheels, can have an audible element to the way they feel. When the whole machine, and this Oltre felt more machine than bike, is carbon that feeling is exaggerated 100-fold. Out on the road that feeling of being on something highly-strung didn’t mellow and bike felt distinctly frisky. There was none of the smooth-rolling that my trusty Cannondale offers, instead you could feel every ripple in the road and you probably need to push a bike like this really hard to get it to feel properly planted on the road. This Oltre was fitted with Campagnolo Super Record EPS (electronic) gears which were as absolute delight. It’s the first time that I’ve been able to try electronic gears on the road and I’m a definite convert to their precision and ease of use. Having had the Cannondale gears stop shifting perfectly on the last couple of rides, it’s obvious that removing the vagaries of cable changers is the way forward and I suggest that even the most cynical of riders try some electronic gears during 2014. My spin took me up the hill out of Tetbury towards Malmesbury, which isn’t a long steep hill by any stretch of my imagination, but it was clear that, while the Planet-X that I tried a few weeks ago was quicker up it than my Cannondale, the Oltre wasn’t another quantum leap ahead in terms of climbing performance. As Dave Brailsford would probably put it, you’re looking at increasingly smaller incremental improvements in performance as the specification increases – and the performance that I could squeeze out of any bike would clearly have plateau’d well below the £15,000 of the Oltre. On purely aesthetic terms, there’s no denying that the Oltre XR is a beautiful bike and the engineering that it encompasses is amazing. But it is an extreme machine and, even if money were absolutely no object, it would be a step too far for me personally. Maybe after a few months on the Sempre, and getting used to a racy carbon bike, that step would be easier. Saying that, if I had a chance to spend this coming Sunday morning on an extended spin on the Oltre I wouldn’t say no. Previous PostDEDOMP – Double expresso, dash of milk, please. Next PostRapha Wind Jacket – worth every penny?